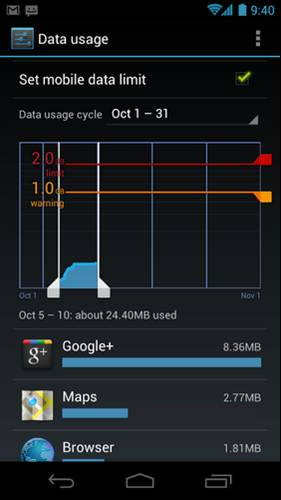 Android 4.0 adds new controls to manage network data usage. Users can see how much of their data allowance they’ve used to manage tiered or metered data plans. Charts and graphs show the amount of data each application is running based on individual data plans. In addition, users can set warning levels or hard limits to disable mobile data when they reach a set amount.